The NAR is not an organization. No one can join or carry a card. It has no leader. I have been called the “founder,” but this is not the case. One reason I might be seen as an “intellectual godfather” is that I might have been the first to observe the movement, give a name to it, and describe its characteristics as I saw them. Sadly, in a piece he wrote for Christianity Today, Ed Stetzer, president of LifeWay Research–the publishing arm of the Southern Baptist Convention–held back the truth that Peter Wagner was seen by many in the Church as a wolf in sheep’s clothing who spent the latter part of his life leading the sheep astray. (Read more on this here) Stetzer wrote that he and his long time friend had disagreements, that he was controversial, and that he was a “fascinating and brilliant man… and he loved the Church.” Stetzer may believe that Wagner loved the Church. However, many people believe otherwise. 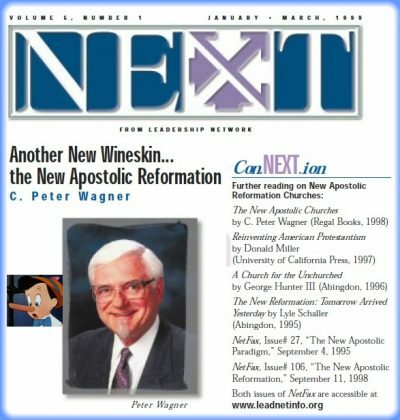 There are a large number of Christians who happen to believe that the man who dubbed himself “Presiding Apostle” of the NAR as well as the “Convening Apostle” of the International Coalition of Apostles was largely responsible for leading the Church into apostasy. Just recently on Friday, October 21st at 2:30 pm false apostolic teacher C. Peter Wagner passed into eternity. One of Wagner’s best friends, “apostle”Chuck Pierce, confirmed Wagner’s death on his Facebook page Friday. In honor of Wagner’s death, longtime friend Ed Stetzer wrote an article at Christianity Today entitled “C. Peter Wagner (1930-2016), Some Thoughts on His Life and Passing” highlighting their friendship. While death can be a sad occasion for those here on earth as they face the lose a close friend, family member or leader. It is an even more woeful thought that the one who died, C. Peter Wagner, is spending eternity in hell. Even more disheartening is that a prominent face in evangelicalism, Ed Stetzer is leading many astray and right into the welcoming arms of the debaucherous neo-evangelical movement by honoring Wagner’s death. Stetzer is essentially aiding in leading people to the same false christ that Wagner worshiped by paying tribute to Wagner’s death. The death of Wagner should not be celebrated, but be used as a lesson to show where false teaching leads — to hell. Is it harsh or judgmental to say that C. Peter Wagner has not passed into glory asCharisma News, and others would lead us to believe? No, it is not judgmental or insensitive to speak the truth. Many may criticize me or Pulpit & Pen for striking while the proverbial iron is still hot, but there is no better time in which to speak truth. Truth is not a respecter of time, emotions, people’s states of mind or what the public deems as proper etiquette. Truth only knows one thing–that it must be proclaimed. As Christians, apologists of the faith once delivered, and polemicists, we must be ready always to speak the truth; no matter the minute, the hour, or the day the truth must go forth. From where do we gather our truth? We receive our final authority, our truth, on all matters from the sufficiency of the closed canon of Scripture — God’s Word.